Coyotzin, bottom left, prepares his contribution to the We Dream in Art Mural. 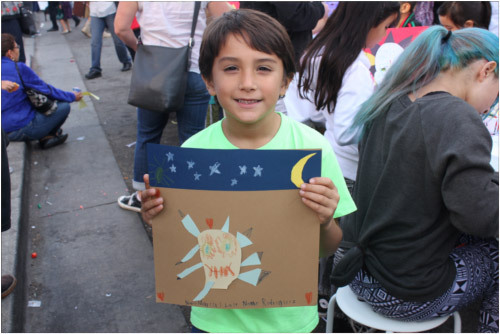 Coyotzin and his family live in the Laurel District and enjoy visiting the Eastside Arts Alliance, they also attended the OMCA’s Día de los Muertos event. For the past few months at a variety of public events, the Oakland Museum of California (OMCA) has been asking Oaklanders: what do you dream for your community, and what would it take for your community to achieve that dream? To which you might respond: what do you mean by community? In Oakland, people seem as likely to refer to the name of their neighborhood as they are their street or their ethnic or racial community, and perhaps even the group of people who they went to high school with. "Fruitvale" is a discrete neighborhood, yet its name is often a stand-in for Oakland's Latino Community, an idea and a hub that stretches beyond its physical boundaries. For some, Fruitvale will forever represent Fruitvale Station, the site of Oscar Grant's death and the namesake of the movie adaptation. Yet while some neighborhoods in Oakland have developed distinct identities, others remain nameless. One man I interviewed referred to his neighborhood of three years simply as "behind Mills College." Other neighborhoods have names that that nobody uses, in spite of real estate developers' eager attempts to market them as up-and-coming. How many Oaklanders would claim "NOBE," a recently coined acronym for North Oakland/Berkeley/Emeryville, as their hood? While the word community is diffuse, community as we experience it is in high demand. We all would like to feel part of at least one, but ideally tapped into the pulses of many communities. Community is a feeling of connection that links you to your surroundings, from the ones that are easy to identify with, like family, to others that feel more distant, like a weed patch in your front yard, or a particularly uncute animal. Even if you have a hard time pinning down how you would define your community, it is still easy to tell when you're acting on its behalf, because it feels necessary. So another way to approach the first set of questions I posed is: what changes in your surroundings feel most urgent or necessary to you? Here at the OMCA, we are inclined to meditate on these questions through art—another word that I don't have an easy definition for. Last month, the OMCA Connect team parked the Oakland Rover at the 18th annual Día de los Muertos festival in Fruitvale to collect peoples' stories with the hope that we can activate a conversation about how people and their communities engage with art in Oakland today. Over a long table set up with art projects organized by Peps 357 and Tommy Wong, arts instructors from our partner organization Eastside Arts Alliance, I talked to children, teenagers, and families about what brought them to the festival and how art makes its way into their lives in Oakland. 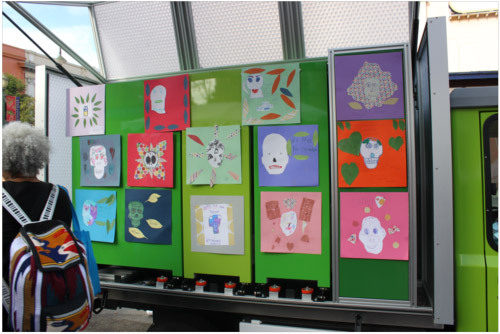 Throughout the day, the Oakland Rover's green panels accumulated 'quilt squares ' that will be incorporated into the We Dream in Art Mural, to be put on a wall outside OMCA in February 2014. Día de los Muertos, the Day of the Dead, is an important reminder of how integral art is to ritual, remembrance, and celebration. The Oakland nonprofit Unity Council organizes the festival to incorporate the holiday into a street fair setting, where there are traditional vending booths that sell food and advertise political candidates alongside booths dedicated to displays of ofrendas (offerings), decorated by artists, community groups, and families. Many booths dedicated to ofrendas gave participants the opportunity to write-in names of their deceased loved ones, while other booths called attention to losses for the broader Chicano community. One booth highlighted the sacrifices of Mexicans who have died crossing the Mexican-American border, and another called attention to the history of colonization of people of color since 1492, and traced its legacy to the familiar issue of gentrification. Allison Santiago, 18, a native of East Oakland and a current student at SF State, also believes that gentrification is the biggest issue currently facing her community in Oakland. Despite her busy schedule and move across the Bay, Allison remains actively involved in Eastside Arts Alliance and other arts organizing groups in Oakland. "Once you're organizing, you're in it for life," she said. Having grown up around political art, Allison says her passion is to teach young people of color how to explore art as a critical communication tool. When people develop "that form of not just writing your name on a wall but actually creating a message through it, [it builds] an intellectual conversation between you and your barrio and your street," she said. Starting an intellectual conversation—whether it be with your street, your barrio, or your broader community—is necessary to confront gentrification, she said. "I feel like the main alternative [to gentrification] is just educating the public about it and letting them know exactly what's going on and letting them know that this is nothing new—this has been going on for generations—and this is just like a modern day colonizing thing that's going on, you know?" she said. "Once the mind is educated and once the mind knows exactly what's going on, you can't just sit there and sit back and let all of this happen." In addition, Allison believes that events like the Fruitvale Día de los Muertos festival are important because they allow brown and black people to come together in a peaceful way. "It's a forum to let the public know that there's so many organizations doing positive work in Oakland and its not only based on crime and police, that there's so many beautiful things that go on in East Oakland and you just got to go out there and explore it," she said. Marcus Rodriguez Jr. recently moved to the Redwood Heights neighborhood of Oakland with his family from San Jose. This is the first time he and his family have attended Día de los Muertos in Fruitvale. Arpana Shah, 40, raises her son Coyotzin in the Lauren District of Oakland precisely because she believes the city's diversity results in a rich cultural life. "Art is just part of living here," she said. "Part of the why we want to be here is because we want [Coyotzin] to see himself reflected, we want him to have a sense of the world, and I think art and culture is really critical for that," she said. "We every so often joke around about going and living in the South Bay where my family is and we're like, 'but what would we do there?'" Arpana believes, like Allison, that the creativity art encourages also has a political dimension. Art is how kids learn "to be part of the political process and part of big transformative change in the world," she said. Rabin Nabizadeh, who also raises a son in Oakland, pointed out that within the city, levels of diversity and arts involvement vary widely by neighborhood. For example, he said that there is a lot more arts culture in the Fruitvale and in other Oakland neighborhoods than there is in Grand Lake, his neighborhood. In some cases, he said, it is difficult to distinguish neighborhoods that seem to have cultural diversity from a vibrant arts community. In Grand Lake, Rabin said, "There's a lot less color. I think the higher socioeconomic status, as the property taxes go up, there's a lot less color that way." This color, or cultural diversity, is one of the Fruitvale Día de Los Muertos festival's main draws. Many children I spoke with urged their parents and guardians to take them to the festival after learning about Day of the Dead in school. Katey Mason of Albany brought her 8-year old son to festival for the first time by his request, she said. Anjali Bhat, 13, learned about the Day of the Dead in her Spanish class at Canyon Middle School in Castro Valley. "It's been cool to see the altars and how everyone in this culture honors the people who have passed on," she said. "And the music is really cool, too." For many Mexican-American families in the greater Bay Area, attending the festival is one way to stay connected to the holiday. Nayelly Avila and Marcela Candenas are from Guadalajara, Mexico and Morelos, Mexico, respectively, but raise their daughters Larissa and Caroline in a small town in Marin County. Nayelly purchased Larissa and Caroline's dresses in Mexico during her last trip home. They had never been to the festival before, Nayelly said, but often come to the East Bay for cultural events. "This celebration is huge in Mexico," she said, "but people usually go to the cemetery." Some Oakland residents weave the festival into more traditional celebrations of the holiday. Jesus Hernandez's family, for example, came to the Fruitvale festival after his daughters danced at St. Mary's Cemetery with their church. George Galvis, who lives in Fruitvale, has been attending the Fruitvale festival and the OMCA Day of the Dead event with his family for years. This year, he said that he was bothered by what he felt were accommodations to the OMCA event that reflected the gentrifying demographics of Oakland. For example, he said, the taco trucks weren't local taco trucks, and he is increasingly worried about cultural appropriation of the Latino community in Oakland, as he witnessed gentrification in San Francisco's Mission District, where he was born and raised until being displaced from the neighborhood in 1996. George hopes that Oakland can avoid the Mission's fate and retain its promise of creating mixed-income neighborhoods. "I feel like there's opportunity when you have a doctor living next to a person who sweeps floors...to have a really vibrant community," he said. "But my concern is that its not going to happen, and that city planners and developers are only going to continue see green and they're gonna shift the character and Disneyize the character of Oakland." According to George, white artists and newcomers to the area are disproportionately the recipients of art grants in Oakland. Meanwhile, he said, "We've had these hometown unsung heroes who've been here for decades, born and raised—their families have been here for decades—that have done beautiful murals on their own time and dime without any compensation and they're not getting the same love and appreciation and respect." Highlighting local artists is also important, George said, because their work provides a clear link to their communities' stories. Narratives about Oakland should "reflect the past, our ancestors, our present, and our vision for the future," he said. Elana Serrano is one of the co-founders of the Eastside Arts Alliance. "I write grant proposals," she said. "That's a type of art…It's kind of like creative nonfiction writing." Elana says that the idea to start the Eastside Arts Alliance 13 years ago came out of the recognition that in Oakland, "Our cultural diversity was our asset." "If we could celebrate that and bring folks together around that," she said, "we could build a base of power to get housing and jobs and all the things the neighborhood needed." Elana hopes that Oakland will remain a stronghold for people to retain their arts traditions even as the city changes. She noted that the redevelopment of West Oakland has killed a lot of local jazz and blues clubs, but that she is trying to start a juke joint scene in deep East Oakland to revive them. "Oakland is so different now, its like that tale of two cities," she said. "I hope Oakland holds on to what it was." 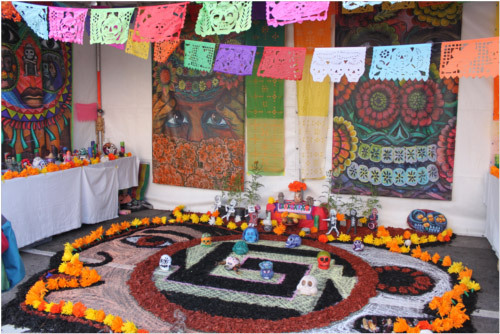 Oakland artist Daniel Camancho's space at the Día de Los Muertos festival. One of the most striking vendor stands that I saw belonged to the artist Daniel Camancho, an Oakland-based artist originally from Mexico City. Daniel is a prolific artist who teaches art at after school programs around the East Bay, has contributed murals all around Northern California, and serves on the Planning Committee for OMCA Día de Los Muertos celebration. Three years ago, he started setting up his own display space at the festival, which he says he likes because the artwork is more participatory. While Daniel's long, murals hang in vertical panels against the back of the tent, marigolds and other sculptural elements, arranged with the help of festivalgoers, take the foreground. While the word community may be difficult to define, its effect is often intuitively grasped in works of art.